In Japan, you must be 20 or older.Japanese law prohibits driving under the influence of alcohol; most other countries have similar laws. Yaegaki Sake & Spirits was founded in 1666 in the Banshu-Hayashida area of Hyogo Prefecture, an area overflowing with natural color and ancient connection to Japanese myth. The blessings yielded by the land enable us to brew sake that augment and enrich the lives of all. Three pillars support and sustain the rich quality of Yaegaki sake: the home-grown king of brewing rice, Yamada-nishiki; the pure natural water for brewing known as Senju no Mizu, drawn from the crystal clear Hayashida River; and the masterful brewing methods and techniques—the kanjikomi—of Yaegaki’s skilled sake brewers. Yaegaki started out as a sake company founded in the Banshu-Hayashida area of Hyogo Prefecture in 1666. 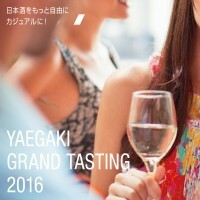 The “Yaegaki” brand, established in 1881, was founded on the brewery’s distinctive and outstanding sake-brewing methods, passed down through its 350-year history. With this history and tradition planted proudly in our hearts, we boldly open new doors to innovation in the dynamic world of sake. Putting our heart and soul into brewing is what makes us “Yaegaki.” Essentially, this comes down to brewing with Yamada-nishiki, a type of brewing rice renowned as a treasure of the locality. 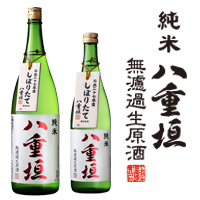 Junmai sake brewed from Yamada-nishiki is perfect for bringing out the full flavors of a tasty meal.